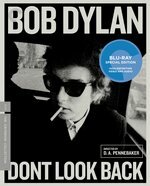 This week’s highlight is The Criterion Collection’s release of D. A. Pennebaker’s seminal “Don’t Look Back” (1967), which captured Bob Dylan on-screen as he never would be again. The legendary documentarian finds Dylan in London during his 1965 tour, which would be his last as an acoustic artist and marked a turning point in his career. The director is given unprecedented access to Dylan’s life here, something that the musician would allow again for almost another four decades. Like an unscripted version of “A Hard Day’s Night,” the film, prodded along by Pennebaker’s camera, pries into Dylan’s life backstage and on-stage, in cabs, lobbies and hotel rooms, surrounded by teen fans, in a heated philosophical argument with a journalists, kicking back with Joan Baez, Donovan and Alan Price — and shows you a man whose star has risen high above the world of folk (and soon, rock) music … and a man who is full of contradictions — petulant, argumentative, bashful, sympathetic, nasty. From the opening cue card credits set to “Subterranean Homesick Blues,” through performances of Dylan’s most famous songs, including “Subterranean Homesick Blues,” “The Times They Are A-Changin’,” and “It’s All Over Now, Baby Blue,” “Don’t Look Back” set the standard for almost every cinema verite rock and roll documentary since. A must study of the man and the zeitgeist. On DVD and Blu-ray, in a new, restored 4K digital transfer, approved by Pennebaker, with newly restored monaural sound from the original quarter-inch magnetic masters, presented uncompressed on the Blu-ray. Some of the extras have been ported over from the 2007 Docurama edition of “Don’t Look Back (1965 Tour Deluxe Edition),” which also included a 168-page companion book with a complete transcription of the film, over 200 photos, and a new forward by D.A. Pennebaker, as well as a collectible “Subterranean Homesick Blues” flipbook” but which, alas, is out of print and commanding premium prices online: Audio commentary from 1999 featuring Pennebaker and tour manager Bob Neuwirth; “65 Revisited,” a 2006 documentary directed by Pennebaker and edited by Walker Lamond; alternate version of the film’s “Subterranean Homesick Blues” cue card sequence; five uncut audio tracks of Dylan songs from the film. New here is an audio excerpt from an interview with Bob Dylan in the 2005 documentary “No Direction Home,” cut to previously unseen outtakes from “Dont Look Back”; a new documentary about the evolution of Pennebaker’s filming style, from his 1950s avant-garde work to his 60s musical documentaries, including an excerpt from the filmmaker’s footage of Dylan performing “Ballad of a Thin Man” during his 1966 electric tour; “Daybreak Express” (1953), “Baby” (1954), and “Lambert & Co.” (1964), three short films by Pennebaker; a new conversation between Pennebaker and Neuwirth about their work together, from “Dont Look Back” through “Monterey Pop” (1967) and beyond; “Snapshots From the Tour,” a new piece featuring outtakes from “Dont Look Back”; a new interview with musician Patti Smith about Dylan and the influence of “Dont Look Back” in her life; a conversation between music critic Greil Marcus and Pennebaker from 2010; and an essay by critic and poet Robert Polito.